A boisterous comedy, Betsy's Wedding finds laughs by refreshing the story of a father overwhelmed by his daughter's impending nuptials. Eddie Hopper (Alan Alda) is a contractor based in Long Island, New York, and married to Lola (Madeline Kahn). 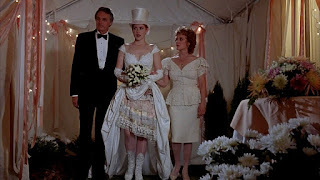 Their daughter Betsy (Molly Ringwald), a budding fashion designer, announces plans to marry boyfriend Jake (Dylan Walsh), who comes from a wealthy family. Despite mounting debts, Eddie gets carried away and offers to pay for a lavish wedding event. With money pressures mounting, Eddie turns to his brother-in-law Oscar (Joe Pesci), a sleazy developer and slum landlord, for help. Oscar is cheating on his wife Gloria (Catherine O'Hara), who in turn is surreptitiously profiting from Oscar's business dealings. Oscar connects Eddie with mobster turned investor Georgie (Burt Young). Soon enough, Georgie's nephew Stevie Dee (Anthony LaPaglia) starts an exceedingly gentlemanly romantic pursuit of Eddie's other daughter Connie (Ally Sheedy), a police officer. Directed and written by Alda, Betsy's Wedding is inspired by Father Of The Bride, and almost as good. While Betsy is essentially reduced to an observer in her own movie, Alda embraces the surrounding madness. The film is all about the insanity that swirls around the main event, and Alda finds plenty of wacky characters and unexpected events to throw at the screen. And with a strong cast and no crass body fluid jokes to be found, this is a classier comedy that scrupulously avoids the lowest common denominator. Oscar is the husband of Lola's sister, but still close enough to the family to gradually occupy the eye of the storm. With Joe Pesci in fine form, Oscar, whether intentionally or not, opens up the door to mobster mayhem as first Georgie and then Stevie Dee become central players in Eddie's life. Burt Young imports all shades of knock-off Godfather colours into the film, unsettling Eddie and eventually thrusting him into the twilight zone of mafia drive-by shootings. Meanwhile Anthony LaPaglia steals the movie already stolen by Pesci. Alda deserves credit for clever writing that allows Stevie Dee to shine as a genuine gentleman despite his dubious roots and the gun in his jacket. He pursues his love in courteous style and persistently sets about melting the heart of the tough-as-nails Connie. Elsewhere enough is going on to maintain admirable energy. Oscar thinks he is hiding an office affair with his assistant who invites herself to the wedding, while all along his wife Gloria is gaining her revenge through shark-like financial dealings. Meanwhile tensions mount between Betsy and Jake, her liberal upbringing and wild fashion sense disturbing the conservative sensibilities of his parents. The film is just the right length at 94 minutes, and the editing is exceptionally sharp: every scene ends exactly when it should, and not a second later. Betsy's Wedding is not a smooth affair, but it's a memorably chaotic event.